Justin Van Kleeck (jsv6s@virginia.edu), still a graduate student at the University of Virginia, is probably off rambling in the woods somewhere near Charlottesville. Angus Whitehead (whitehead65_99@yahoo.co.uk) is a doctoral student based at the Centre for Eighteenth Century Studies, Department of English and Related Literature, University of York. His thesis explores the residences, fellow inhabitants, neighbors, friends and milieus of William and Catherine Blake, 1803-31. Joyce H. Townsend (joyce.townsend@tate.org.uk) is Senior Conservation Scientist, Tate, and the editor of William Blake The Painter at Work (2003), which includes contributions from her and from Bronwyn Ormsby, Conservation Scientist, Tate; Julia Jönsson is a former Conservation Scientist, Tate; Mark Evans is Senior Curator of Paintings, Victoria and Albert Museum. 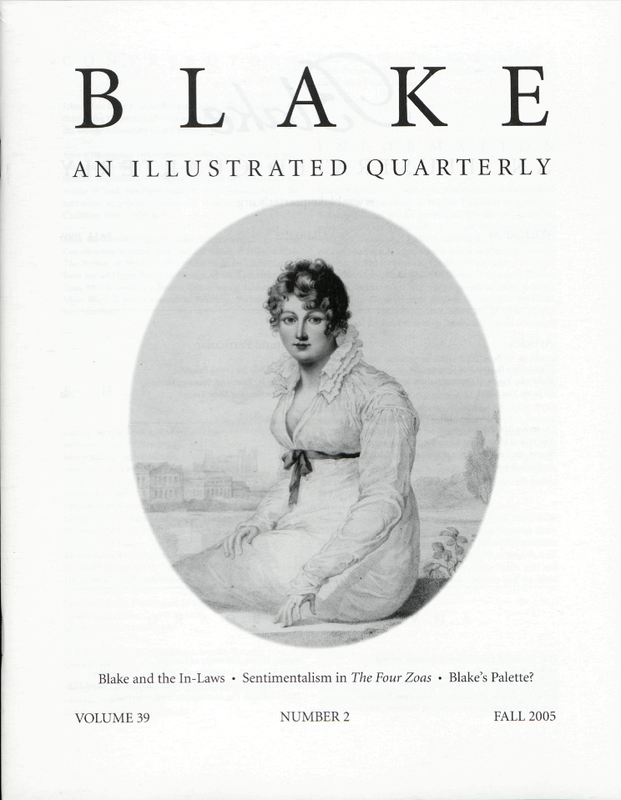 Cover: William Blake, “Mrs Q,” after François Huet Villiers, detail. British Museum Department of Prints and Drawings, BM cat. no. ps 293666. © Copyright, the Trustees of the British Museum. See page 92.